Aren’t these fries the cutest? 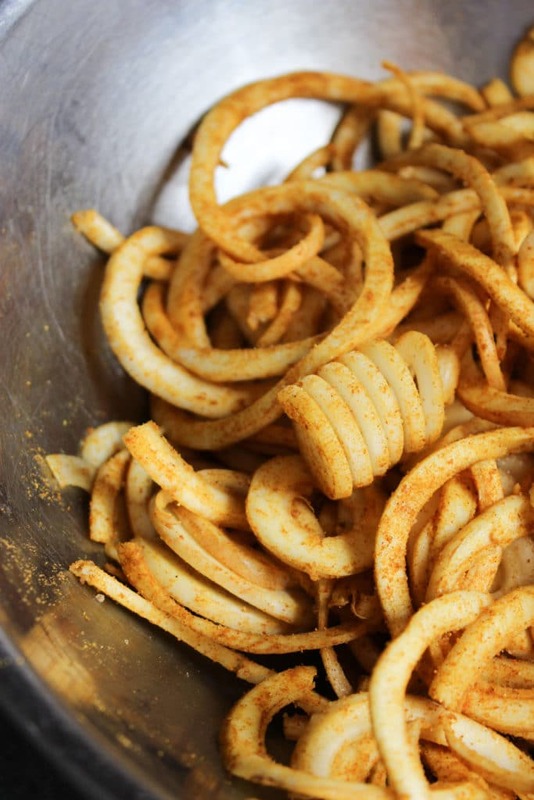 They’re curly and crunchy and dusted with spices and [BONUS!] they’re baked instead of fried. We’re only 8 days into the year and I’ve already busted out the spiralizer. Can I get a round of applause, please? Every time I use my spiralizer I remember just how much fun it is. 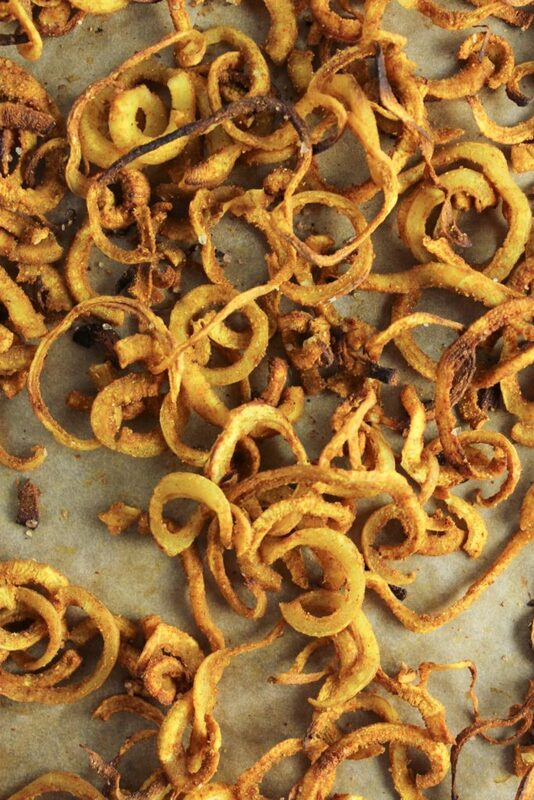 It’s great for making “pasta” healthier, yes, but clearly it’s also really for making curly fries. It may not be my most frequently used kitchen tool, but it is one of my favorites. The possibilities are endless and it’s so inexpensive! Trust me, you need one. PS – it’s also super easy to clean. Now, go get yours! Enough about my spiralizer . Let’s talk about parsnips and these fries. If you’ve never tried them before, you might be wondering what parsnips taste like. To put it simply, if a carrot and a potato had a baby and that baby grew up and had a baby with ginger, that baby would be a parsnip. To tone down some of their earthiness and bring out their softer side, I seasoned them with a blend of Indian-style spices to create a warm, balanced flavor with just a hint of heat. 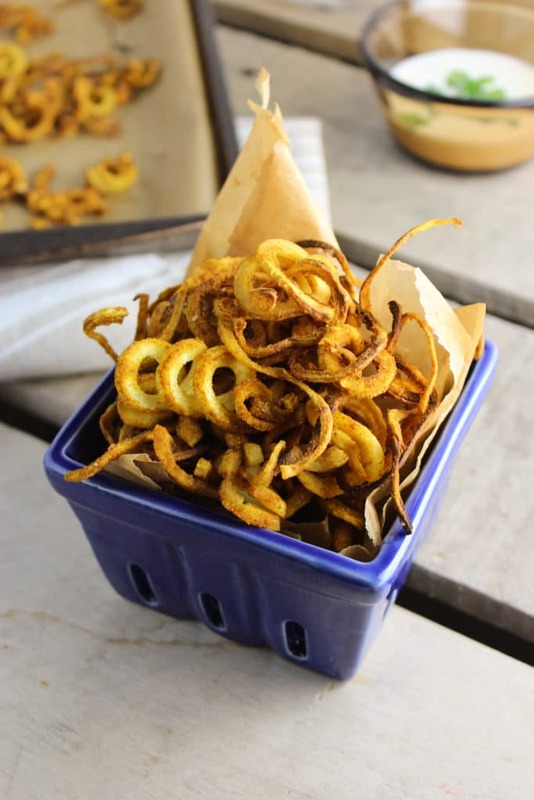 The result is a pile of golden brown curly fries that go crispity-crunch when you grab a handful and don’t leave you with that ugh-I-just-ate-fried-food feeling. McDonalds ain’t got nothing on these. 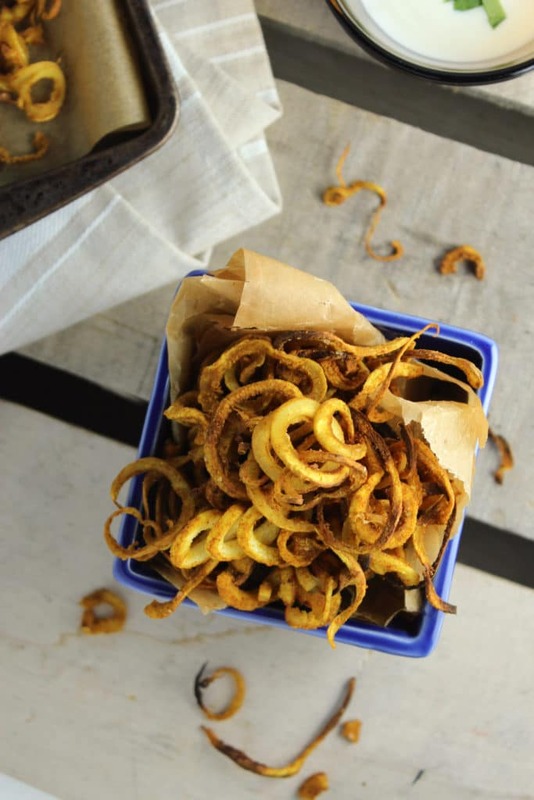 These crispy, crunchy curly fries are made of spiralized parsnips and spiced with a blend of curry, ginger, and cinnamon. Preheat oven to 415º and line two baking sheets with parchment paper. Wash parsnips and chop about 1/2 inch from the tops [the widest end]. 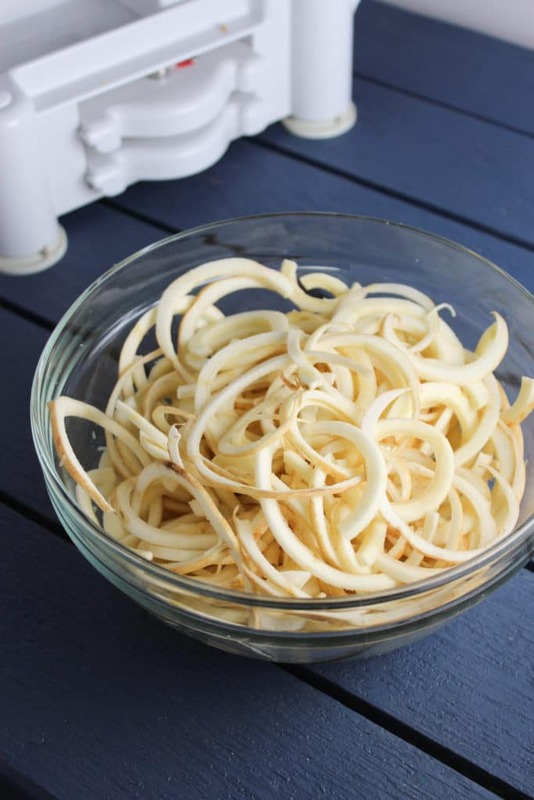 One at a time, fit parsnips to your spiralizer and get to work! 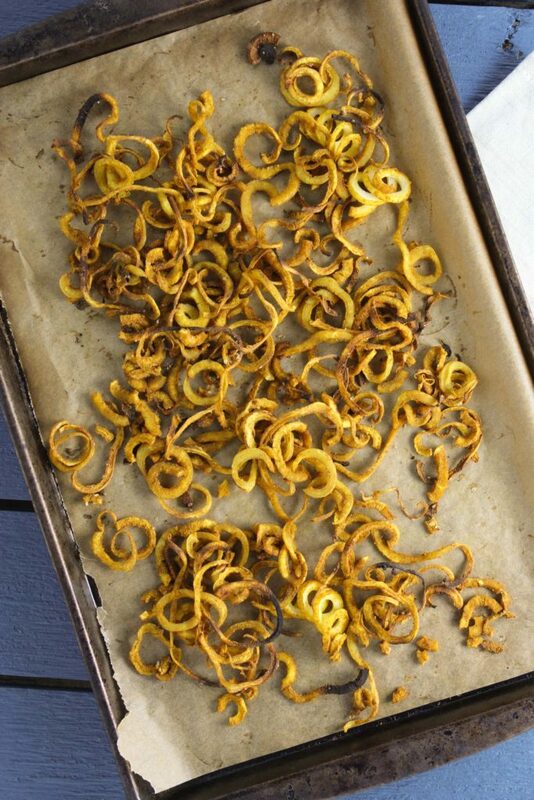 Using a knife or your hands, break up the parsnip curls into 4-5 inch pieces. Nobody wants to eat a 3-foot long curly fry, am I right? 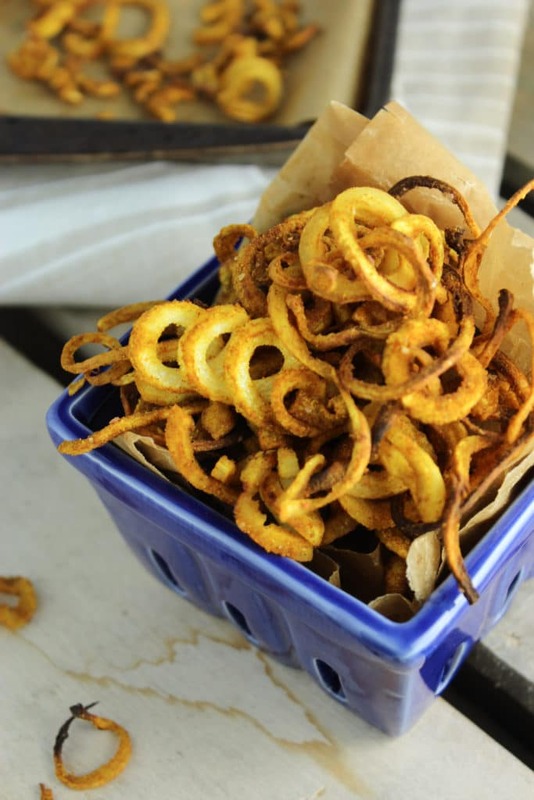 Place the spiralized “fries” in a large bowl. Add olive oil to the parsnips and toss to coat them. Then add seasonings and toss until coated again. Arrange fries on the baking sheets, as evenly spread out as possible. Bake 15 minutes, until they start to turn brown and look crispy. These were awesome. I just found out I am intolerant to potatoes but, after dinner tonight, I am not so sad at the thought of never having a french fry again. Thank you, thank you, thank you. I ate them all myself. One sitting. Oink. 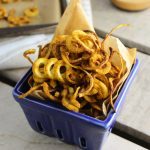 I have had my spiralizer for a while but I have yet to make fries. Using parsnip is a great idea!